Plans like the Green New Deal could end up making the U.S. more dependent on China, according to reports. A new study found the U.S. would need to import more rare earth minerals from China to build more offshore wind turbines. “These demands would total over 15.5 [gigagrams] of neodymium by 2050,” reads the study. A new study underscores a longstanding concern about sweeping plans, like the Green New Deal, to increase renewable energy use in America: dependency on China. The study, published in the journal Nature Sustainability and highlighted in a Friday E&E News report, found that plans to ramp up offshore wind energy production will require huge amounts of rare earth minerals produced in China. “These demands would total over 15.5 [gigagrams] of neodymium by 2050, of which 20% could potentially be avoided by circular usage from decommissioned turbines but only if recycling technologies are developed or, better still, magnets are designed for reuse,” the study found. Experts say neodymium is a key mineral for large-scale offshore wind turbine development, which need to be more reliable than their onshore counterparts. It’s also used in electric cars and other technologies. However, the “current supply dominated by a single country, China,” the study noted, which could increase U.S. energy dependency on foreign countries, including China, should a plan, like the Green New Deal, ever be put into action. 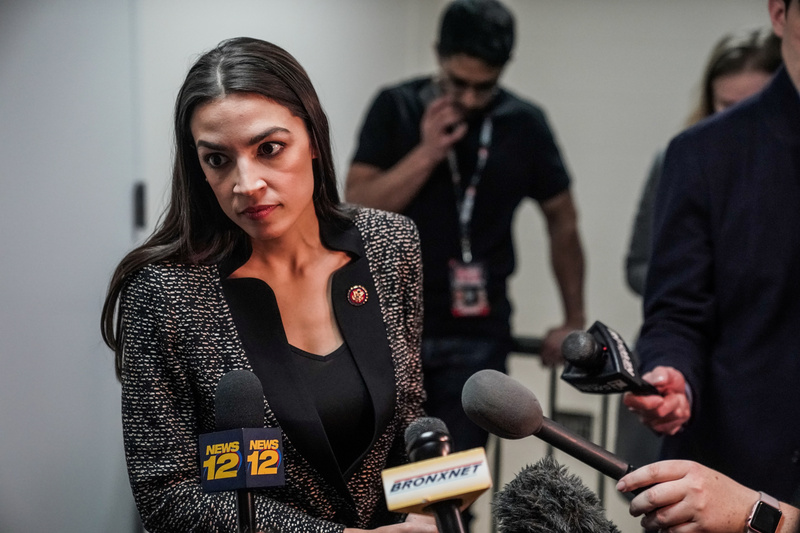 U.S. Representative Alexandria Ocasio-Cortez (D-NY) speaks to reporters after finishing a televised town hall event on the Green New Deal in the Bronx borough of New York City, New York, U.S., March 29, 2019. REUTERS/Jeenah Moon. But plans like the Green New Deal are more ambitious, and aim to achieve “net-zero” greenhouse gas emissions within 10 years. The non-binding resolution was introduced by New York Rep. Alexandria Ocasio-Cortez and Massachusetts Sen. Ed Markey, both Democrats, in February. The resolution calls for “dramatically expanding and upgrading renewable power sources” to achieve Democratic lawmakers’ climate change goals. That likely means more imports of not just neodymium, but also other critical minerals used to make solar panels and wind turbines. Critical minerals, like praseodymium, dysprosium, terbium, indium and silver, would also see increased demand to meet the production needs of a Green New Deal. “Currently, China is the dominant player in critical metal production — and its dominance is growing,” reads an analysis of critical minerals commissioned by the Dutch government. 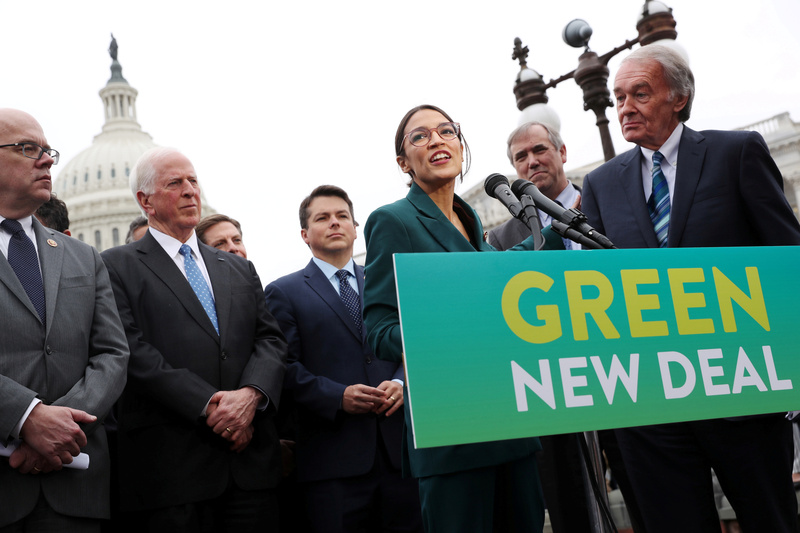 U.S. Representative Alexandria Ocasio-Cortez and Senator Ed Markey hold a news conference for their proposed “Green New Deal” to achieve net-zero greenhouse gas emissions in 10 years, at the U.S. Capitol in Washington, U.S., Feb. 7, 2019. REUTERS/Jonathan Ernst. The Green New Deal also calls for “zero-emission vehicle infrastructure and manufacturing,” which means more electric cars on the road. That’s going to also ramp up U.S. demand for neodymium because it’s used by automakers, like Tesla, to propel its Model 3. But that’s not all. Electric cars require batteries, which need lithium and cobalt. While most of the world’s cobalt is mined in the Democratic Republic of Congo, about 40 percent is refined in China, according to a recent paper. “China already dominates global battery manufacturing and is on track to supply nearly two-thirds of all production by 2020,” Manhattan Institute senior fellow Mark Mills wrote in a paper published in late March. “For the U.S., at least, given where the materials are mined and where batteries are made, imports would increase radically. Perspective on each of these realities follows,” Mills wrote.